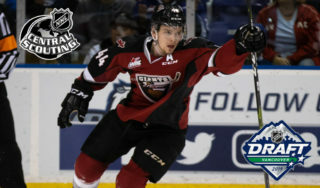 A busy stretch of games ended on a high note for the Vancouver Giants Sunday at home. 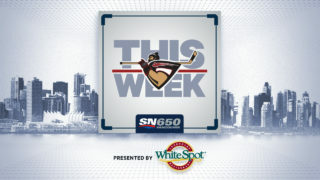 Owen Hardy scored twice and goaltender Trent Miner stopped 28 of 29 shots as the Vancouver Giants (10-2-2-0) earned a 3-1 victory over the visiting Kelowna Rockets (4-10). 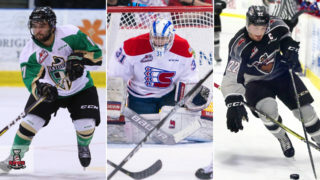 Rookie Justin Sourdif added a goal for the Giants while defenceman Bowen Byram chimed in with two assists. Kyle Topping had Kelowna’s lone goal which came on a third period power play. Depsite both teams suiting up for their third game in as many days, neither showed signs of fatigue in the opening period. Passes were crisp and the scoring chances were many, but Trent Miner and Rockets starter Roman Basran were both dialled in early. 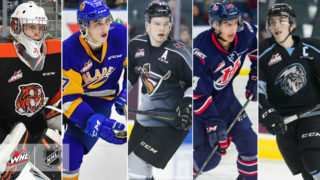 Vancouver opened the game’s scoring at 15:26 of the first when Owen Hardy knocked home a feed from Dawson Holt in close to secure his third of the season and his first of two on the night. Bowen Byram earned the second assist on the play, starting the whole sequence from the left-wing boards. Shots were 11-7 for Kelowna after one but the Giants led 1-0. 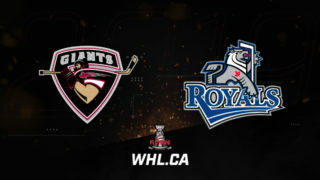 Early in the second period the Giants extended their lead to 2-0 when Justin Sourdif took a pass from Brayden Watts in front of the net, moved to his right and outwaited Roman Basran to convert on his fourth of the season. Through 40 minutes the Giants remained on top 2-0 with Kelowna holding a slight 18-15 edge in shots. Kelowna’s power play moved them back within a goal at 7:42 of the final period. Kyle Topping parked himself in the right-wing circle and one-timed a feed from Liam Kindree past Miner for his fourth of the season. 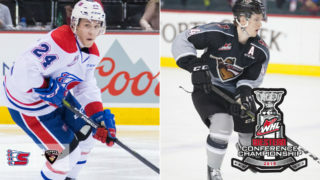 Kelowna’s power play finished the night one-for-three while the Giants went zero-for-three on their man advantage opportunities. Just over four minutes later the Giants answered with an insurance marker off the stick of Owen Hardy. The 1999-born Nanaimo product parked himself in front of the Kelowna goal and deflected home a Bowen Byram point shot for his fourth of the season spoiling all hopes of a Rockes comeback. When the final buzzer sounded the Giants mobbed goaltender Trent Miner who made 10 of his 28 saves in the third period. The final shot tally was 29-24 in Kelowna’s favor. With the victory the Giants increased their B.C. Division lead to six points over the Victoria Royals. They remain first overall in the Western Conference through 14 games and have a goal differential of +16 which is also tops in the West. Next up for the G-Men: Some much needed rest. They’ll return to action at home on Saturday, October 27th when they clash with the Seattle Thunderbirds at 7:00 PM. During their seven-game, 10-day stretch the Giants finished with a record of 4-1-2-0 earning 10 of 14 available points. In two meetings with the Kelowna Rockets this season, Trent Miner has stopped 59 of the 60 shots he’s faced. His overall record of 3-0-1-0 on the season. With the win, the Giants improved their home record to 5-1-1-0 through seven games.